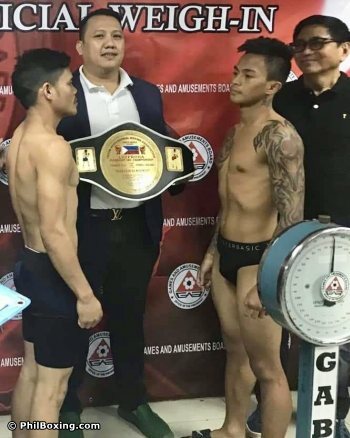 The heat is on for double-title rumble Saturday afternoon (Oct 27) at Quibors Boxing Gym in Molino 2 in Bacoor, Cavite; a boxing show set to thrill fans in attendance. Boxers already went through the weigh-in official ceremony Friday at GAB head office in Makati with the supervision of GAB Boxing Division Chief Dioscoro B. Bautista. 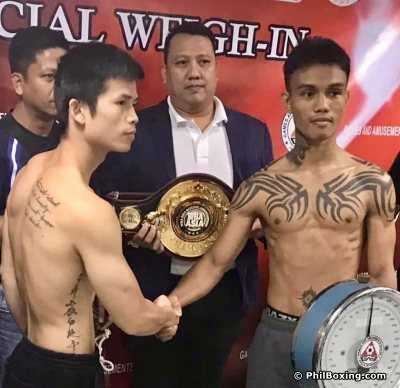 In the main event, 26 year-old Dipolog native Alphoe Dagayloan (10-2-5, 4 KO's) battles Chinese warrior Rongguo Wu (6-1-2, 2 KO's) of Guiyang for the vacant WBA Asia East Flyweight Strap, a tough mission for both boxers who come from impressive knockout wins. Rongguo Wu (L) and Alphoe Dagayloan shake hands during official weigh-in. 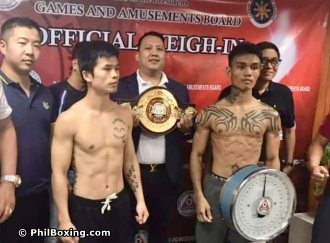 In his last rumble, the Filipino Dagayloan spectacularly stopped unbeaten strong Kazakhstan boxer Madiyar Zhanuzak in eight rough rounds for a TKO win in Russia; while the the Chinese Rongguo Wu, 32, ravaged Thailand boxer Wanchai Nianghansa in five rounds last August in Shanghai. The Chinese fighter Rongguo Wu is the reigning WBC Silver Flyweight titlist as well as the current WBO Greater China Light Flyweight champion, and today he also wants to claim the WBA Asia East belt. Will the aggressiveness and toughness of the serious, well-focused, well-trained Rongguo Wu proved too much for the heavily tattooed Pinoy? Or will the taller Filipino southpaw of the Quibors Boxing Gym be able to handle the come-forward style of the Chinese, countering him with huge hands to stop him and claim the shining WBA Asian East belt? In the co-main event, the 20 year-old "Amazing Boy" Francis Jay Diaz (6-1, 1 KO) of the Quibors Boxing Stable trades mean blows with experienced Boholano southpaw Powell Balaba (9-26-1, 5 KO's) of the Elorde Gym for the Luzon Professional Boxing Association (LUZPROBA) Light Flyweight Belt. Boholano Powell Balaba (L) of the Elorde Gym faces off Francis Jay Diaz of the Quibors Gym during weigh-in. Promoter Joseph Quibral shows LUZPROBA belt for the winner. Will the younger "Amazing Boy" have enough boxing in him to deal with a more tested man as Powel Balaba? Or will a surprise result drop jaws at Quibors Boxing Gym Saturday? Exciting supporting pro fights complete the entertaining show, including Joseph Ambo vs Albert Alcoy, Kevin Aseniero vs Rolly Llino, Roberto Gonzalez vs Edsil Jungco, Mark Henry Escriber vs Elmar Zamora and more. Billed as Bakbakan Sa Molino Part 9, the exciting fight card is a production of active promoter Joseph Quibral of Quibors Boxing Promotions in association Gerry Balmes, manager Orlando Borcelango and the matchmaking effort of Jimmy Vallares Jr.
Fights start at 2 PM. The author Carlos Costa is a Panama-born man of boxing living permanent in the Philippines. Carlos can be reached by email: Carlos512@hotmail.com and Whatsapp: +639184538152.